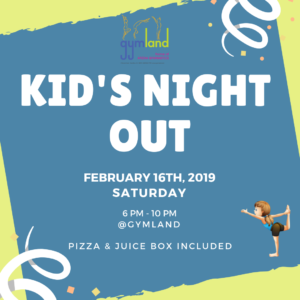 Kid’s Night Out at Gymland ! Join us for a fun day on February 16th, 2019 ( Saturday). Pizza 🍕 and juice box 🥤 included! Activities: gymnastics 🤸🏻‍♀️, gym ninja course, arts and crafts, create your own cupcake 🧁, glow dance party and our inflatable Morphy! Call our office or register through online portal to save a spot now! Kids will enjoy fun gymnastics activities, obstacles courses, arts & crafts, and the ever popular zip line, Morphy, and the tube! Sibling and two day discounts available. Early drop and late pick up are available. All attendees must be atleast 3 and potty trained. Please pack a snack, lunch (full day), and water. Registration is available onine through the Parent Portal.